3 miles of running today! Yahoo! Back at it but slowly! I could really feel my muscles working hard to keep me going. 2 was on the schedule but I was feeling Ok at the time to do another mile. I probably should have just did two. Live and learn. I'm sure the runs will start to get easier again as time goes on. 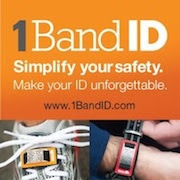 Running - 133 miles of running in May - including my first marathon(Blah, blah, blah....yes, I know you are already tired of hearing about it. Haha. Too bad! Lower miles due to the taper. Biking - 10 miles; really? 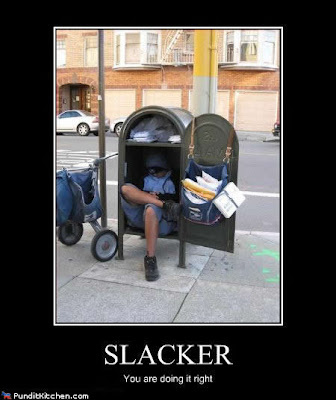 Slacker! Only 1/4 what I normally do. I really need to get back to this especially since it's nicer outside. Weights - 4 workouts in May; yikes! 1/2 what I normally do. The plan is to get back to cross training twice a week after this week. I'm also considering training with similar miles of my marathon training but maybe be a little more flexible on it. 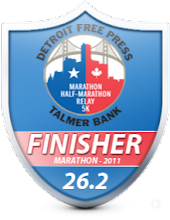 I'm considering running the full Detroit Marathon instead of the half. Fortunately I have until October 1 to decide that so I'll know if I'm ready or not(it's on 10/16). 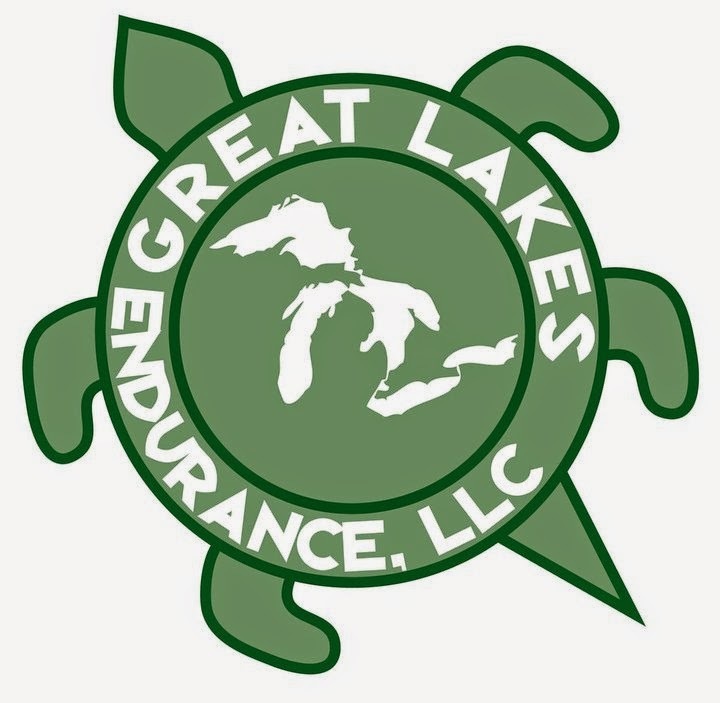 If I'm not ready, I'll stick with the half marathon and hopefully have an awesome time for the half since I'll have trained more than needed for the half. My goal is 1:39:59 for the half. I also need to work on nutrition. I need to get used to getting more calories in me before and during my long runs so I can be fueled and ready to run another marathon without the slow down in the last four miles. Question of the day: Have you lacked on anything in your training lately? Have a great day and.....Keep Running. I totally feel the difference when I slack on the cross training...I caught up on your marathon race reports, CONGRATS!!!!! You had a great month!! My running was exactly where I wanted it for May. I didn't do what most consider cross training, but now that I'm digging in my gardens I did everything I wanted in May. :) I only hope I can keep it up. And, biking? What is this thing you write of? I think that picture should be replaced with one of me. My May recap would be more like: missed 90% of my workouts (thanks marsh fires), did no strength training (really need to get on that), did no core training (a strong core will help my running? really?) and did maybe 3 days of cross-training. I'm with Suzy - biking? Ugh. Still, I'm hoping the marsh fires here are put out soon so I can return to running... and all that other stuff. That's awesome that you loved your marathon so much that you're considering running another this year! I really hope I have the same feelings after mine! I can't wait to read your race report. That's awesome that you're considering another full!!! My training has lacked MILES lately. That and hydration. I'm getting back at it though. I've slacked on stretching and foam rolling. I must make more time for each of these! I am running the full in October too! I say go for it!! I've been lacking in my mileage lately. I have a half marathon on Saturday and only ran 85 miles in May. But I hope June will bring more miles, and my goal for my half isn't to PR. I've adjusted my goals and expectations from this race. Hey there, new reader (and fellow Detroiter) here! Love your blog so far, and I can absolutely commiserate with you on the lack in training. I ran the Kalamazoo Marathon a few weeks back and have done more or less nothing since then. But, since the weather's finally turned, I suppose now's the time to head back out! I REALLY should do weight training, but I'm lacking motivation...darn it!